The Royal College of Veterinary Surgeons (RCVS) would like to pay tribute to Professor Martin Gore a renowned cancer expert who sadly passed away earlier this month. 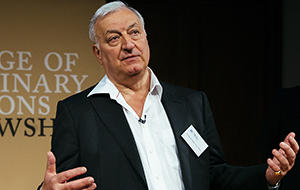 Professor Gore (pictured right from the 2016 Fellowship Day), who was Professor of Cancer Medicine at the Institute of Cancer Research, was the guest speaker at our inaugural RCVS Fellowship Day in October 2016, delivering a talk focused on the ‘academic and service provider divide’ in human medicine. Commenting on Professor Gore’s death, Professor Nick Bacon, Chair of the Fellowship Board, said: “It is with great sadness that the Organising Committee and Board of the RCVS Fellowship learnt of the untimely and sudden passing of Professor Martin Gore CBE. “Professor Gore, 67, was a pioneer of cancer care and research in the human field, especially ovarian, melanoma and renal cell carcinoma, and his work was recognised in 2015 when he was awarded The Royal Marsden’s Lifetime Achievement Award by Prince William. “It was for this reason, among many, that he was invited to be the Keynote Speaker at the Inaugural RCVS Fellowship Day in 2016, where he discussed the challenges of performing clinical research within a busy hospital.